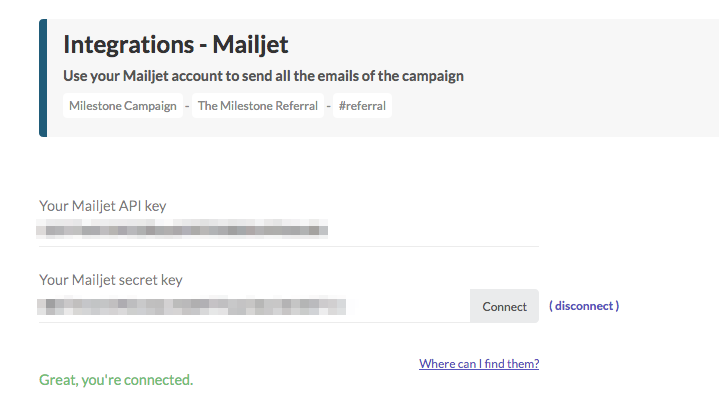 You can have your campaign participants automatically added to your Mailjet account as contacts the moment they join the campaign. To find your API keys, check out this article on the knowledge base of Mailjet. Once you do that, new participants to your campaign will be getting passed as contacts in your Mailjet account. You can use your own Mailjet account to send the emails of the campaign (such as the welcome email). To do that, enable the relevant checkbox and type the From address you would like to use. Make sure to enable and verify your sending address and domain in Mailjet so that you can use it. Check out this documentation article from Mailjet if you need more help.